In this tutorial you will create, review, and run the default project in Visual Studio, which will allow you to become familiar with features of ASP.NET. Also, you will review the Visual Studio environment. How to create a new Web Forms project. The file structure of the Web Forms project. How to run the project in Visual Studio. The different features of the default Web forms application. Some basics about how to use the Visual Studio environment. Select New Project from the File menu in Visual Studio. 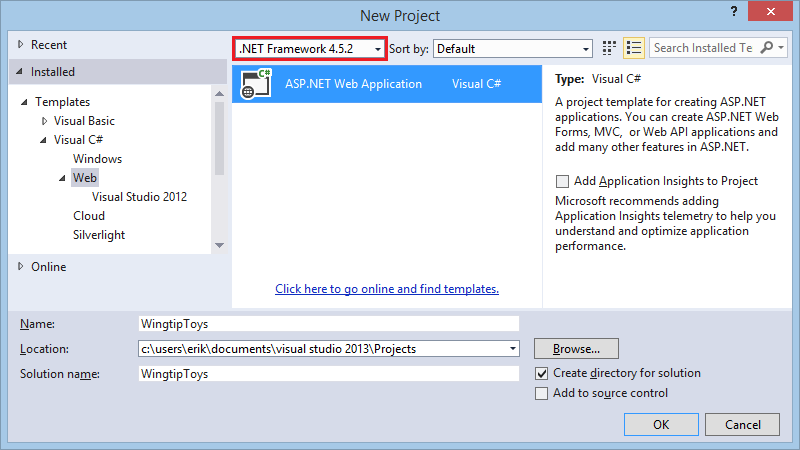 This tutorial series is using .NET Framework 4.5.2. Name your project WingtipToys and choose the OK button. The name of the project in this tutorial series is WingtipToys. It is recommended that you use this exact project name so that the code provided throughout the tutorial series functions as expected. Click the Change Authentication button. Select Individual User Accounts and click the OK button. Select the Web Forms template and click the OK button. The project will take a little time to create. When it's ready, open the Default.aspx page. You can switch between Design view and Source view by selecting an option at the bottom of the center window. Design view displays ASP.NET Web pages, master pages, content pages, HTML pages, and user controls using a near-WYSIWYG view. Source view displays the HTML markup for your Web page, which you can edit. ASP.NET Web Forms lets you build dynamic websites using a familiar drag-and-drop, event-driven model. A design surface and hundreds of controls and components let you rapidly build sophisticated, powerful UI-driven sites with data access. The Wingtip Toy Store is based on ASP.NET Web Forms, but many of the concepts you learn in this tutorial series are applicable to all of ASP.NET. ASP.NET Web Pages targets developers who want a simple web development story, along the lines of PHP. In the Web Pages model, you create HTML pages and then add server-based code to the page in order to dynamically control how that markup is rendered. Web Pages is specifically designed to be a lightweight framework, and it's the easiest entry point into ASP.NET for people who know HTML but might not have broad programming experience - for example, students or hobbyists. It's also a good way for web developers who know PHP or similar frameworks to start using ASP.NET. ASP.NET Web API - A framework for building HTTP services that reach a broad range of clients, including browsers and mobile devices. ASP.NET SignalR - A library that makes developing real-time web functionality easy. Default.aspx Typically the first page displayed when the application is run in a browser. Site.Master A page that allows you to create a consistent layout and use standard behavior for pages in your application. Global.asax An optional file that contains code for responding to application-level and session-level events raised by ASP.NET or by HTTP modules. Web.config The configuration data for an application. The default Web application provides a rich experience based on built-in functionality and support. Without any changes to the default Web forms project, the application is ready to run on your local Web browser. Press the F5 key while in Visual Studio. The application will build and display in your Web browser. Once you have completed review the running application, close the browser window. There are three main pages in this default Web application: Default.aspx (Home), About.aspx, and Contact.aspx. Each of these pages can be reached from the top navigation bar. There are also two additional pages contained in the Account folder, the Register.aspx page and Login.aspx page. These two pages allow you to use the membership capabilities of ASP.NET to create, store, and validate user credentials. ASP.NET Web Forms are pages that are based on Microsoft ASP.NET technology, in which code that runs on the server dynamically generates Web page output to the browser or client device. 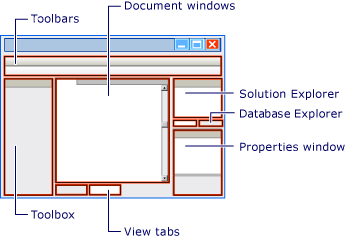 An ASP.NET Web Forms page automatically renders the correct browser-compliant HTML for features such as styles, layout, and so on. Web Forms are compatible with any language supported by the .NET common language runtime, such as Microsoft Visual Basic and Microsoft Visual C#. Also, Web Forms are built on the Microsoft .NET Framework, which provides benefits such as a managed environment, type safety, and inheritance. When an ASP.NET Web Forms page runs, the page goes through a life cycle in which it performs a series of processing steps. These steps include initialization, instantiating controls, restoring and maintaining state, running event handler code, and rendering. As you become more familiar with the power of ASP.NET Web Forms, it is important for you to understand the ASP.NET page life cycle so that you can write code at the appropriate life-cycle stage for the effect you intend. When a Web server receives a request for a page, it finds the page, processes it, sends it to the browser, and then discards all page information. If the user requests the same page again, the server repeats the entire sequence, reprocessing the page from scratch. Put another way, a server has no memory of pages that it has processed-pages are stateless. The ASP.NET page framework automatically handles the task of maintaining the state of your page and its controls, and it provides you with explicit ways to maintain the state of application-specific information. The ASP.NET Web Forms Application template provides a rich set of built-in functionality. It not only provides you with a Home.aspx page, an About.aspx page, a Contact.aspx page, but also includes membership functionality that registers users and saves their credentials so that they can log in to your website. 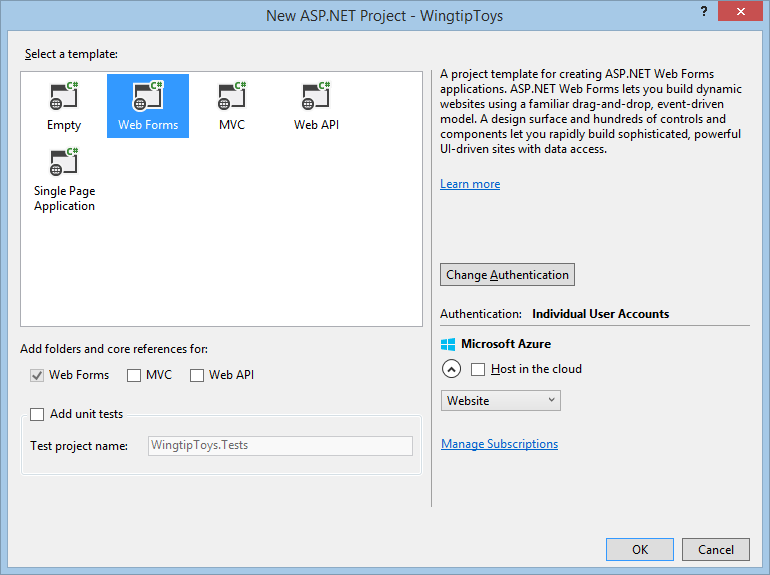 This overview provides more information about some of the features contained in the ASP.NET Web Forms Application template and how they are used in the Wingtip Toys application. ASP.NET Identity stores your users' credentials in a database created by the application. When your users log in, the application validates their credentials by reading the database. Your project's Account folder contains the files that implement the various parts of membership: registering, logging in, changing a password, and authorizing access. Additionally, ASP.NET Web Forms supports OAuth and OpenID. These authentication enhancements allow users to log into your site using existing credentials, from such accounts as Facebook, Twitter, Windows Live, and Google. By default, the template creates a membership database using a default database name on an instance of SQL Server Express LocalDB, the development database server that comes with Visual Studio Express 2013 for Web. SQL Server Express LocalDB is a lightweight version of SQL Server that has many programmability features of a SQL Server database. SQL Server Express LocalDB runs in user mode and has a fast, zero-configuration installation that has a short list of installation prerequisites. In Microsoft SQL Server, any database or Transact-SQL code can be moved from SQL Server Express LocalDB to SQL Server and SQL Azure without any upgrade steps. So, SQL Server Express LocalDB can be used as a developer environment for applications targeting all editions of SQL Server. SQL Server Express LocalDB enables features such as stored procedures, user-defined functions and aggregates, .NET Framework integration, spatial types and others that are not available in SQL Server Compact. An ASP.NET master page defines a consistent appearance and behavior for all of the pages in your application. The layout of the master page merges with the content from an individual content page to produce the final page that the user sees. In the Wingtip Toys application, you modify the Site.master master page so that all the pages in the Wingtip Toys website share the same distinctive logo and navigation bar. 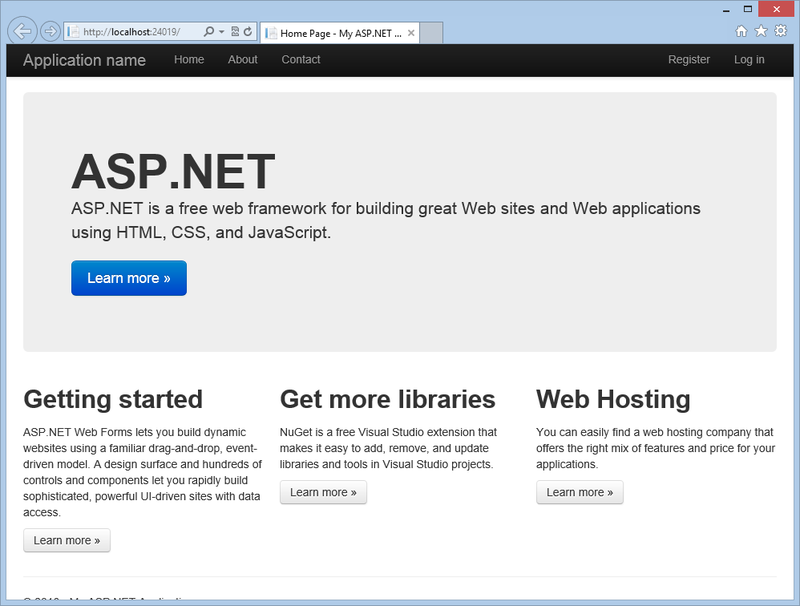 The ASP.NET Web Forms Application template supports HTML5, which is the latest version of the HTML markup language. HTML5 supports new elements and functionality that make it easier to create Web sites. 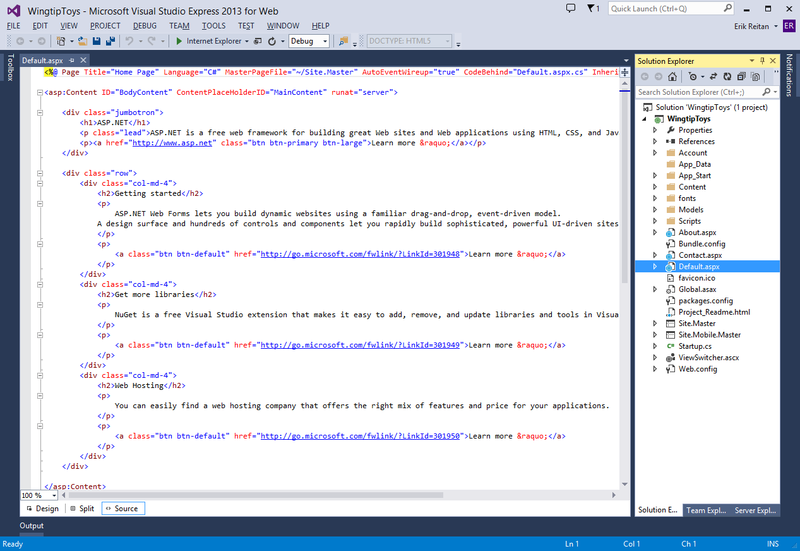 The Visual Studio 2013 project templates use Bootstrap, a layout and theming framework created by Twitter. Bootstrap uses CSS3 to provide responsive design, which means layouts can dynamically adapt to different browser window sizes. You can also use Bootstrap's theming feature to easily effect a change in the application's look and feel. By default, the ASP.NET Web Application template in Visual Studio 2013 includes Bootstrap as a NuGet package. The ASP.NET Web Forms Application template includes a set of NuGet packages. These packages provide componentized functionality in the form of open source libraries and tools. There is a wide variety of packages to help you create and test your applications. Visual Studio makes it easy to add, remove, and update NuGet packages. Developers can create and add packages to NuGet as well. When you install a package, NuGet copies files to your solution and automatically makes whatever changes are needed, such as adding references and changing the configuration associated with your Web application. If you decide to remove the library, NuGet removes files and reverses whatever changes it made in your project so that no clutter is left. 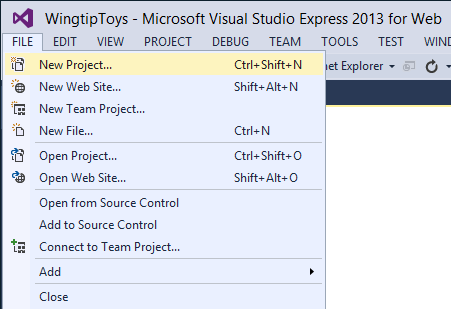 NuGet is available from the Tools menu in Visual Studio. Besides the features in the ASP.NET Web Forms Application template, the Wingtip Toys application uses Entity Framework Code First, which is a NuGet library that enables code-centric development when you work with data. Put simply, it creates the database portion of your application for you based on the code that you write. Using the Entity Framework, you retrieve and manipulate data as strongly typed objects. This lets you focus on the business logic in your application rather than the details of how data is accessed. 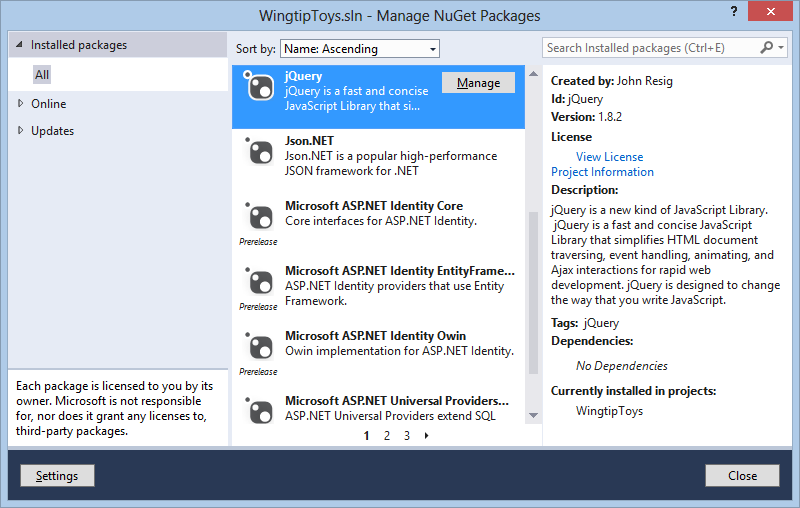 For additional information about the installed libraries and packages included with the ASP.NET Web Forms template, see the list of installed NuGet packages. To do this, In Visual Studio create a new Web Forms project, select Tools > NuGet Package Manager > Manage NuGet Packages for Solution, and select Installed packages in the Manage NuGet Packages dialog box. The primary windows in Visual Studio include the Solution Explorer, the Server Explorer (Database Explorer in Express), the Properties Window, the Toolbox, the Toolbar, and the Document Window. For more information about Visual Studio, see Visual Guide to Visual Web Developer. In this tutorial you have created, reviewed and run the default Web Forms application. You have reviewed the different features of the default Web forms application and learned some basics about how to use the Visual Studio environment. In the following tutorials you'll create the data access layer.